8mm Tape to DVD transfer. 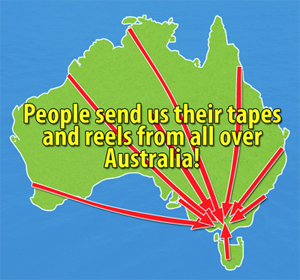 Melbourne, Darwin, Hobart, Perth, Adelaide, Brisbane, Sydney, Canberra & the rest of Australia. Transfer your 8mm Tapes to DVD, file or hard drive today! We don't just transfer 8mm tapes to DVD. We also transfer VHS, S-VHS, Beta, VHS-C, Hi8, Digital8, MiniDV and Umatic tapes.